During the ISS show we had a number of possible users ask about how the patented tack works and what the implications are. The tack is comprised of an inert chemical that does not activate until the temperature reaches 140 C. At that point the tack activates and adheres to the fabric. This eliminates ghosting and issues associated with not using tack paper. Some have inquired as to whether the tack ink will completely replace tack dye sub paper and the answer is no. In some cases where the fabric density is limited, tack paper may be needed. In the case where tack paper is used with NeoTack ink, then the combined tack is the strongest tack available. 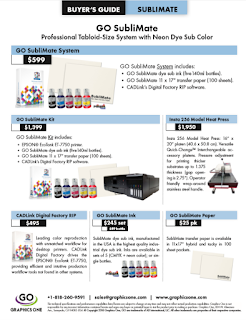 At $125 per liter, GO NeoTack offers the best dye sublimation ink value in the market.